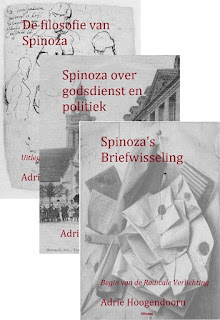 Naar aanleiding van het blog dat ik gisteren schreef en dat ik wegens de afbeelding op de cover van Speculum Spinozanum 1677-1977, de titel meegaf “Een zaligverklaring van Benedictus de Spinoza...” ontving ik een link naar een site met aanbiedingen van dat boek en tot mijn verrassing stond daar een uitvoerige tekst, waarin meer gegevens over Siegfried Hessing vermeld worden. Graag maak ik daarmee een apart blog over hem – om te bewaren. „Anfang 1933 kam in einem deutschen Verlag eine Spinoza-Festschrift heraus, die jeder in die Hand nehmen sollte, der noch irgendwelchen Zweifel an dem jüdischen Charakter des Spinozismus hat. Unter 22 Verfassern, die Beiträge lieferten, befinden sich hoch gegriffen vier bis fünf Nichtjuden, darunter der Ehren-Bolschewist Romain Rolland. Siegfried Hessing behoorde met Paul Wienpahl, Jon Wetlesen en Arne Naess tot degenen die de filosofie van Spinoza trachtten te verbinden met boeddhisme, taoisme en (neo-)confucianisme. Interessant is om de pogingen te zien hoe hij in correspondenties Einstein en Freud bij Spinoza-herdenkingen probeerde te betrekken. Over Freud schreef hij een hoofdstuk in Speculum Spinozanum 1677-1977, [Londen, 1977] en drukte daarin een brief van Sigmund Freud aan hem af op p. 228. Siegfried Hessing was a Polish-Jewish writer and student of philosophy. 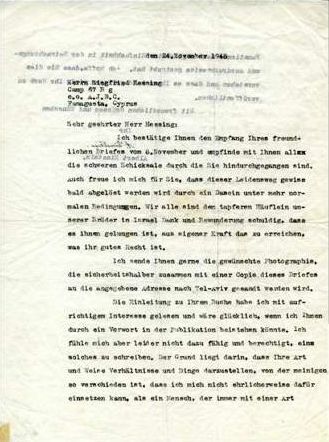 That Einstein and Hessing were known to each other for some years is confirmed by the existence of at least a dozen letters exchanged between them; the earliest 1932 shows Hessing seeking Einstein's assistance for his work on Spinoza. When conditions in Czernowitz Poland became too grim Hessing sought help in emigrating with his wife and son. Forced to remain in Poland for the duration of the Holocaust they survived and eventually boarded a ship for Palestine. The British intercepted them in the Dardanelles and sent them to internment along with more than 51000 other Jews in Cyprus for a period of 18 months. 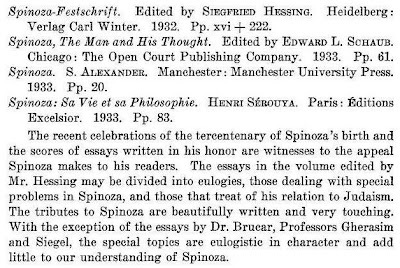 Here Hessing continued in his scholarly work concentrating on the philosopher Baruch Spinoza whom Einstein so much admired. In 1948 Hessing wrote to ask Einstein to write a forward to his upcoming book on Spinoza. Einstein responds by empathizing with all Hessing had been through goes on to praise the spirit of Israel and finishes by providing the answer to the questions about his driving force and guiding principle in science. Typed Letter Signed in German Princeton November 24 1948 to Hessing. "I am confirming the receipt of your friendly letter of November 8 and empathize with you for all the difficulties you have had to suffer through. I am also happy for you that this path of sorrow will soon come to an end through the presence of more normal circumstances. We all owe thanks and admiration to the brave band of our brothers in Israel that they have succeeded in attaining by their own hand that to which they have a just right. I am glad to send you the photograph you desire which will be sent for the sake of security together with a copy of this letter to the address in Tel-Aviv. I've read the introduction to your book with great interest and would be happy if I could support you by means of a forward in your publication. I do not feel however capable or justified to write such a forward. The reason is that your way of representing relationships of one thing to another differs so much from my way that I cannot honestly enter into such a thing as a person who has always striven with a kind of fanaticism for the highest degree of simplicity in my observation and expression. I hope that you understand this and that you will soon be successful in publishing your work." Hessing went on to immigrate to the United States and write on the life and times of Spinoza. 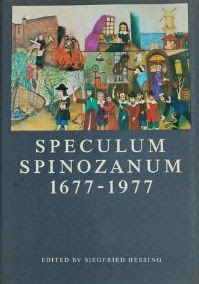 He was the editor of Speculum Spinozanum 1677-1977 which included a contribution by Einstein. * This letter was obviously kept by Hessing all his life as a particular treasure as it was folded in such a way that it might be carried in a wallet. This has resulted in some fading and wear but the letter is perfectly legible and the signature is very dark and strong. Einstein is well known for saying "Nature is the realization of the simplest conceivable mathematical ideas" and "I have been guided not by the pressure from behind of experimental facts but by the attraction in front from mathematical simplicity." Here he takes it one step further indicating that the underlying motivation behind his life of scientific inquiry was the driving desire to find simplicity in all things. He also expresses his gratitude to and admiration for those Jews who created the State of Israel showing both his strong support and his belief that they had succeeded a fact not universally appreciated at the time. * Wat uiteraard niet zo was. Einstein die op 18 april 1955 was overleden, kon geen bijdrage meer leveren aan een boek dat 1977 werd uitgegeven. Zie hier informatie op het Einstein Archief over de brieven die Hessing en Einstein met elkaar wisselden. Alleen de data worden gegeven. Geen van de brieven is gedigitaliseerd. 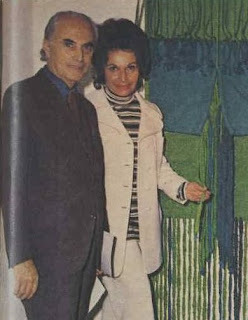 Over de herkomst van bovenstaande krantenfoto met Siegfried Hessing en zijn vrouw, de naïeve kunstenares Perle Hessing, geboren Hirsch.